Our 2017 Toyota RAV4 Electric Storm Blue was the talk of residents in my office building this week. They stood and looked it over, trying to decide if it was, indeed â€œblue,â€ or what exactly, was the color. AS with most press vehicles I park in front, my fellow office renters love to see what I am driving next. 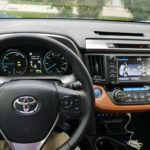 This writer is beginning to become a convert for hybrid vehicles; at least in the Toyota lineup. The last few Iâ€™ve driven have become strong contenders in my next â€˜to buyâ€™ list. The 2017 RAV4 is sharp looking, with a few more angles and a redesigned up-to-date look. The angled headlamps and creased bodywork give it a different look that stands out some. This is a very practical SUV, competing with a lot of other good choices, namely, Hyundai Tucson, Kia Sportage, Jeep Cherokee, Ford Escape, Honda CR-V, etc. We did not experience any difficulty hopping onto the highway from the ramp. This hybrid performs and you forget it has but 194 horse under the hood. Our Electric Storm Blue stood out and the interior, in our words, decked out with a classy two-tone black/tan leather seats reminiscent of the 1970s Mercury Cougar offering. We werenâ€™t sure the Blue matched with this interior seat color scheme. Itâ€™s different. As expected when opting for a Hybrid vehicle, the RAV4 has a MSRP of $34,030. Our test vehicle, the Limited edition came equipped with a few extras, including a Tonneau cover ($90), carpet floor mats/cargo mat ($224), Mudguards ($129), and Body side moulding ($209). The Advanced Technology Package ($1,435), includes Birdâ€™s Eye View Camera with Perimeter Scan, Entune, Premium JBL Audio with Integrated Navigation and App Suite, which includes the Entune Multimedia Bundle, 7-in. high resolution touch-screen with split screen display, AM/FM, 11 JBL GreenEdge speakers, including subwoofer, auxiliary audio jack and USB 2.0 port with iPod connectivity and control, Advanced Voice Recognition, Hands-Free Phone Capability, Phone Book Access and Music Streaming via Bluetooth wireless technology, Siri Eyes Free, Entune App Suite, HD radio, HD radio predictive traffic and doppler weather overlay, AM/FM cache radio, Sirius XM Satellite Radio with 3-month complimentary access trial, Gracenote Album Cover Art and Integrated Backup Camera Display with projected path tonneau cover. One of the first small SUVâ€™s on the market in the mid-90s, the RAV4 is a favorite with female drivers. Now in its fourth generation, this style has been with us since 2012. 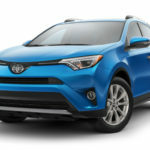 A small car-based SUV with five seats (no third row), the RAV has a reputation for practicality, dependability, comfort and is very easy to maneuver. 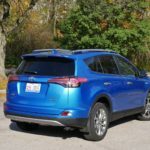 Having sold some 286,809 units, the RAV is a close second in sales to Hondaâ€™s CR-V.
As with all Toyota products, the 2017 RAV offers lots of safety equipment, including Toyota Safety Sense-P, forward-collision warning (which we felt today when trailing a little too close to the car in front of us), lane-keeping assist, adaptive cruise and automatic high-beam headlights. The RAV comes in a top-of-the-line Platinum trim for 2017. New to the lineup, the Platinum carries a MSRP of $35,690 front front-wheel-drive; adding $1400 when opting for all-wheel-drive. The Platinum model includes a monochromatic exterior and luxury features like hated steering wheel, 360-degree-view camera and power liftgate. Worth paying more for? Weâ€™re not sure. Standard equipment on the RAV4 Limited is quite plentiful. The RAV is a spacious and comfortable SUV. One wonâ€™t tire of driving this in all kinds of conditions, road surfaces. It isnâ€™t the heaviest SUV and can feel light when hitting a pothole or making a sharp turn. Of course, rear seats fold flat, into the floor, making towing your stuff effortless. Even with the hybrid battery pack, youâ€™re only giving up two cubic feet of cargo space. The first time in a long time we drove a re-designed Mitsubishi Mirage and we found it enjoyable. For a little commuter car, this Mirage fits the bill. We even found it handy when we needed to load a bicycle to take to our destination point to begin a Sunday ride. The bike didnâ€™t fit all the way in, but it was a lot more convenient than a sedan with a backseat that doesnâ€™t collapse. There are a lot of likes about the Mirage, including the practical high-utility design, and of course, the great fuel economy. The maneuverability and parking ease, and the ease of driving. Our press car was the entry-level manual so it was easy to drive. Handling is mediocre, but about expected in a small sub-compact. Trying to navigate highway driving is an effort, and highway acceleration is sluggish. Noise and vibration are there, but not as much as we expected. One of the lowest-priced new cars on the U.S. market, the Mirage is probably the most fuel-efficient of the sub-compacts; a lot of car for the money. For Mitsubishi in the U.S., the Mirage is made in Thailand, and hopes to make some inroads here among all the options a consumer could select. Sales seem to be somewhat decent, but probably not enough to save the brand here in the U.S. In fact, our local Mitsubishi dealership closed last month. Which isnâ€™t a commentary, necessarily, about the brand. There is just too much to choose from. Although the Mirage isn’t all that rewarding to drive, it does have some redeeming qualities. Donâ€™t expect it to be totally quiet inside, although it didnâ€™t bother our driving to hear a little noise-and-vibration; the kind that makes small cars low on the desirability scale in the past. An economy car, the 2017 Mitsubishi Mirage may be a great value for budget-conscious buyers, and it is an economy car. The economy cars, although not that popular in the U.S., do happen to make sense in other parts of the world. Competition includes such cars as the Ford Fiesta, Smart Fortwo, Nissan Sentra, Kia Rio and Chevrolet Spark. All a little costlier, but not by much. Again, it really depends what kind of driving youâ€™re going to be doing in the Mirage. The Mirage is powered by a 1.2-liter three-cylinder engine, with 78 horsepower (up from 74 hp last year), due to new variable valve timing and a roller-type camshaft. This engine provides exceptionally good fuel efficiency, however, as one might assume, a 3-cylinder offers a very modest performance. Performance isnâ€™t noticed as much when driving under 40 mph or so, but when attempting to attack highway-merging and driving, acceleration is especially sluggish, and missing to make any fast moves. The five-speed manual transmission costs less but actually has lower fuel-economy ratings, and for any comfort, one needs to drive in fifth gear. According to Mitsubishi, improvements to the Mirage have been made to handling for the 2017 model, along with improved spring rates and optimized damping, stiffening the suspension, and upgrading the brake system with bigger front discs and rear drums. With standard 14-inch wheels and tires, one may want to opt for the 15-inch upgrade (standard on the SE and GT models). Upgraded seat upholstery, a new steering wheel and some upgraded trims and switchgear also come on the 2017 Mirage. Hard plastic surfaces make up the dash and although the interior isnâ€™t anything to write home about, itâ€™s functional. Think economy car. One of the smallest five-door hatchbacks sold in the U.S., the is a combo of minicar and subcompact class. While much larger than a Fortwo, the Mirage actually does have backseat space that fits two adults, and cargo when lowered. Looks arenâ€™t everything and the Mirage isnâ€™t a handsome offering. However, itâ€™s a little cute box that functions as needed, offers great fuel economy and gets you most places. Styling changes for 2017 include a new front and rear bumper, lower-body treatment and updated grille. Headlights have been changed, as have foglamps and the new 14-and 15-inch alloy wheels and new rear spoiler are a redesign. The Mirage is offered in ES, SE and GT trim levels. Our base ES included A/C, keyless entry, steel wheels and four-speaker, 140-watt sound system. Bluetooth compatibility is optional on the base model. If consumers opt upwards, they can have a new infotainment system display with Apple CarPlay and Android Auto compatibility, alloy wheels, automatic climate control, rearview camera, cruise, steering wheel audio controls and push-button start. Our test car did have the back-up camera. Safety has been a bit of a shortcoming of the Mirage, with its ‘poor’ rating in the small overlap frontal test from the Insurance Institute for Highway Safety (IIHS) particularly worrisome. The Mirage’s safety set includes seven airbagsâ€”driver and passenger front and side bags, side-curtain bags over the front and rear windows, plus a knee airbag for the driver. And while the Mirage is very inexpensive, it still includes stability control, traction control, and all the typical anti-lock braking systems. Hill assist is also a standard feature on the Mirage, power windows and push start. ABS, tire pressure monitoring system and side curtain airbags. There were no options on our test Mirage ES, and final vehicle pricing was $15,630. Pretty decent in this time of high auto prices. EPA fuel economy: 41/36 mpg. Redesigned for 2017, the LX 570 is fresh on the market; the definition of a â€œperfectâ€ vehicle, this road cruiser is the dream of many a customer. 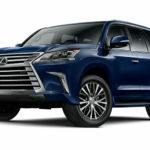 Stretching out to global auto markets, Lexus plans to sell the LX 570 in China, Japan, Korea, France, Germany and Russia. Reaching a large class of people, the LX 570 luxury SUV offers multiple functions, operations, systems and better fuel economy. Environmentally friendly, luxurious and new on all fronts, the 2017 LX 570 looks up-to-date, inside and out. You name it, the LX 570 offers it-to all markets. Seats are comfortable with cool and warm air, depending on the season, and music lovers will appreciate the 19 speaker entertainment system. Competing with such vehicles as Range Rover, Land Rover, Lincoln Navigator, Mercedes-Benz GX also redesigned), Audi Q7 and Cadillac Escalade. 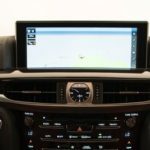 This updated Lexus has a new interior, updated nav, Bluetooth, an electronically-controlled transmission, and full-time 4-wheel drive. A weather-resistant SUV, the LX 570 comes equipped with several air bags, front knee bags, carries seven passengers, and alerts the driver through pre-collision warning system, traction control, intuitive parking assist, satellite radio and glowing indicators and intensive LED light bults. For comfort, expect a heated steering wheel, USB connectivity, and small LCD lights at the rear of the front seats. Originally launched in 1995, the Lexus LX 570, a takeoff on the Toyota Land Cruiser, the second generation came in 2007, as a 2008 model. That model was then refreshed in 2012. With a full spare tire, the Lexus LX 570 gets a 20-inch alloy wheel and tire. These are massive and provide good road feel, yet a very comfortable, quiet ride. No question driver and passengers alike will be protected in the best fashion possible. Safety is a key factor in the Lexus and airbags abound for all, as well as stronger seatbelts, fire alarm devices, GPS tracker, ABS and emergency braking. Lexusâ€™ 5.7-liter V8 engine is under the hood, matched with the eight-speed automatic transmission. Full-time 4×4 all-wheel-drive, as noted above, prepares for any kind of driving; with TORSEN limited-slip center differential. 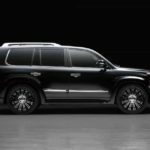 Expect the standard price of the 2017 Lexus LX 570 to initially begin at $84,000, and go upward from there. A high cost for any luxury SUV generation. We donâ€™t expect a vehicle of this caliber, however, to be towing many boats, or being the â€˜ruggedâ€™ SUV many favor. In fact, we found the braking in the 2017 LX 570 to be quirky and sensitive and took a while to get used to. Not something we wanted to have to deal with on a daily basis. The steering is heavy and do know, this is one big vehicle to drive around; and/or park. Our LX 570 came equipped with the optional entertainment system with rear-seat DVD. This is a classy cabin and lends itself well to long roadtrips. The 12.3 inch touchscreen sits high and is easy to read. We didnâ€™t try the park assist but expect it would probably be a helpful option; particularly for the small diminutive females we see driving this vehicle around Chicago. Adaptive cruise is also a favorite option, and handy during Chicago-area highway driving. Who buys these over-size behemoth vehicles? Silly question, I suppose. Our area is loaded with Range Rover products; one looking just like the next, as do its drivers! It has always been a wonderment to this writer the popularity of the Navigator and Cadillac Escalade. Other than â€˜cultâ€™ cars, the appeal doesnâ€™t translate over all markets. We canâ€™t help but wonder, when a consumer opts for a car of this sophistication, do they all know how to operate all these new options? They are formidable and take some time for non-technos to memorize and appreciate the value of their worth. EPA Fuel Economy: 13/18 mpg. The Toyota Tundra is a full-size pickup best known for its durability. This second-generation Tundra was introduced as a 2007 model and updated for 2014. For 2016, Tundra gets a small exterior update, some have a larger fuel tank (38 gal, against standard 26.4 gal), and an updated infotainment system. For 2017, the Tundra receives new paint colors. Toyota discontinued Radiant Red. Our Inferno and Quicksand colors are available on the SR4 and Limited models. Now available on the SR models are Barcelona Red Metallic, Super White and Black. Now standard on the Tundra is also a tow hitch. 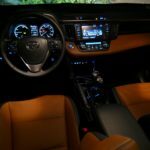 The Limited and TRD Pro Tundras come with Toyotaâ€™s premium audio system and app suite, together with Toyotaâ€™s Entune infotainment system. Opt for the Platinum and 1794 Edition versions and you can expect a JBL premium audio system, as well as standard Blind Spot Warning System. On the Limited, you get standard front bucket seats. The only choice of engine in the Tundra is Toyotaâ€™s V8; either the 4.6-liter or the 5.7-liter V8. Our test Tundra 4×4 came equipped with the 5.7-liter, a powerful, well-executed engine. The base 4.6-liter V8 is rated at 310 horsepower and 327 pound-feet of torque, and is in the SR5 4×2, double cab. Standard on certain versions, the 5.7-liter V8 generates 381 horsepower and 401 pound-feet, and is the engine on the SR 4×2 regular cab with the long bed, and the Limited 4×2 double, as well as the Platinum 4×2 CrewMax. Rear-wheel drive and four-wheel drive are both available; our test version came with the 4×4, part-time 4-wheel-drive with electronically controlled transfer case. The CrewMax ($49,580) models are fitted with a 66.7-inch bed, four door and backseat bench. This is standard on the Platinum and 1794 Edition trim levels. The largest trucks, however, do not have lockable storage within the cargo bed, a damped tailgate operation or steps or handrails. Tundra doesnâ€™t offer as many configurations as other trucks on the market; although, when trying to configure what youâ€™d want in a truck, one can get overwhelmed by all the choices. Just starting out, consumers can opt for the Tundra entry-level SR ($32,190) model, go up from there to the SR5 ($34,000), TRD Pro (off-road), Limited ($41,720), and Platinum. When going for broke, consumers can choose the all-but-the-kitchen-sink model, the 1794 Edition (named for a Texas ranch where the factory is). Although weâ€™re located in a large city and the surrounding suburbs, driving a truck is great fun. People donâ€™t ogle you as much as in years past since it is a more common site. If your suburb village allows you to park a pickup in the driveway, youâ€™re in. Basic standard safety equipment is on par, and includes eight airbags, however, the latest in technology (i.e., active safety features, adaptive cruise, collision warnings), isnâ€™t available. Crash test scores are about average (four stars) for the Tundra; some versions receiving only a three star rollover rating. Our Tundra Limited came with leather seating, 20-inch alloy wheels, automatic dual zone and climate control and rear backup camera. We enjoyed driving the Tundra and didnâ€™t think the added off-road package made the ride any worse. This is a very comfortable and well-equipped truck, and when driving on the highway, is smooth and quiet. Our Tundra Ltd came equipped with the larger fuel tank (38 gal), although in the few short days of driving, we never had to fill up. Although at only an average 15 mpg., driving the Tundra on a regular basis might drain the pocketbook. The 6.5 doubled-walled bed came with rail caps, a deck rail system with four adjustable tie-down cleats. The power horizontal rear window is nice and the dogs loved it! The driverâ€™s seat is 10-way power, with a 4-way power adjustable passenger seat. Our Limited was also equipped with the tow package (rover hitch, 4.30 axle ratio, engine/transmission fluid coolers, TOWHAUL mode, and heavy-duty battery and alternator. Options on our test Tundra included the TRD Off-Road Package (Upgrade standard wheels to 18-inch split, 5-spoke TRD Off-road package alloy wheels with black accents and all-terrain P27/65R18 tires; Trail-Tuned Bilstein Shock Absorbers, engine skid plate, fuel tank skid plate, front tow hooks, and bed side TRD Off-road decal, $45). The color-Inferno-was a bright orange-ish-copper so popular this year. We loved it. Receiving a major refresh in 2014, the 2017 Toyota Tundra is largely carryover from the 2016 model. The off-road oriented TRD Pro model was new for the 2015 model year, and includes 18-inch TRD Off-Road alloy wheels, trail-tuned Bilstein shock absorbers, engine skid plates, fuel tank skid plates, front tow hooks on rear-drive variants, and a TRD Off-Road decal. The 4.0-liter V-6 was dropped from the Tundra line starting with the 2014 model, making the Tundra an all-V-8 lineup. The base 4.6-liter V-8 makes 310 hp and 327 lb-ft of torque. The 4.6-liter engine is standard on the SR and SR5 trims. Limited and TRD Pro Tundras come with a Toyota premium audio system and an app suite together with the Entune infotainment system. The Platinum and 1794 Edition variants come standard with a JBL premium audio system. Blind spot warning now part of the Limited Premium package and comes standard on the 1794 Edition and Platinum grades. The Limited trim receives standard power front bucket seats for 2017.